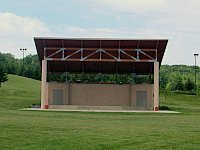 In JULY 2002, the Black River Area Community Band board of directors decided to investigate the possibility of a bandshell at Lunda Community Park. Other groups invited to join in this venture were the Black River Arts Alliance, Falls Players, Rhythm of the River, Pine Tones, Jackson County Youth Theater, Black River Falls Parks and Recreation Dept. and the Lunda Park Committee. There was a desire for a place for public performances and to provide a weekly summer concert series similar to other communities. Having a permanent facility would eliminate the need to set up temporary staging. It would be a great benefit and addition to the park and an asset to the community. At the committee’s first meeting in the SUMMER OF 2002, goals were set for planning and funding. Their first step was to get plans and ideas from other municipalities who already had bandshells and summer programs. The committee met again in AUGUST 2002. Designs and costs were discussed. If project planning could be completed on a timely basis, it may be possible to start the summer concert series as early as the next year. In FEBRUARY 2003, preliminary plans were received from the planner. Next, the committee studied plans and concerns and made recommendations so that a final presentation plan could be completed. In APRIL 2003, the committee met with Peter and Joan Hoffman to go over final plans and get commitment from them as to their financial contribution towards the bandshell. With the Hoffman’s financial commitment, in MAY 2003, the Lunda Park Board met to discuss and approve the plan. Discussions continued with the Lunda Park Board about financing the balance of the project. With the project going forward, the bandshell committee met in JULY 2003 to discuss uses, maintenance, and scheduling ideas. Another meeting was held in MARCH 2004. At this time, scheduling and pricing was discussed. The bandshell committee is to act as the advisory group for the bandshell. Guidelines and policies were formulated by the committee. Rental rates were set by the City of Black River Falls. The first Tuesday “Concert in the Park” schedule was set for the SUMMER OF 2004. 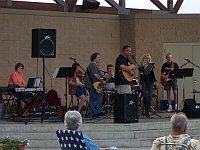 On JUNE 8, 2004, the first bandshell concert was presented by the Black River Area Community Band. Dedication and ribbon cutting was officially done during another Community Band performance on AUGUST 3, 2004. In JULY 2005, the official name for the structure was determined. It would be: The Bandshell at Lunda Park. In JANUARY 2006, the committee decided that weekly donations would be split 50% to the performing group, 25% for a bandshell maintenance fund, and 25% in a special fund to defray costs of special guests. Since the opening concert in June 2004, many groups have entertained there. See some of the photos from those performances in the photo gallery. The Black River Area Community Band kicks off each summer concert series by holding the first performance at the Bandshell each June and closes the season with the final concert in August. For further information about the Tuesday night Concert in the Park series, please contact the band or call the Chamber of Commerce at 715-284-4658.